The Ensenada Region provides ecosystem services including water resources that sustain population needs, agriculture and other economic activity. These ecosystem services should be protected as part of the current governmental plans and locally raised conservation initiatives without great conflict. Water resources management in Mexico faces infrastructural, institutional and financial challenges. There is a need to coordinate planning and funding to embrace and financially sustain local initiatives. 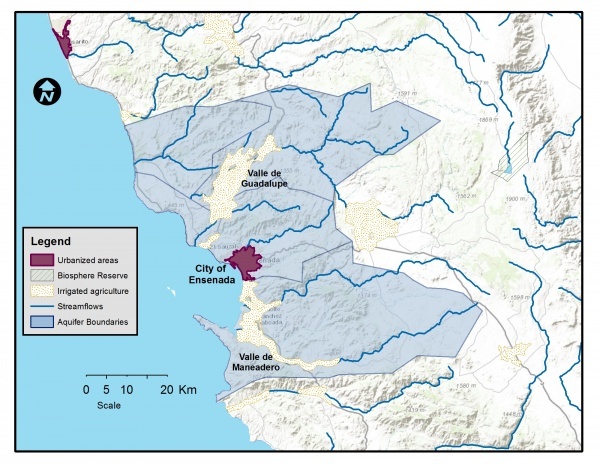 Water issues in the Ensenada Region include aquifer overdraft, over allocation of water use concessions, saline intrusion and a poor institutional infrastructure to address these problems in organized manner. Hence the opportunities for a Water Fund to help are present. Ecosystem services can coexist with current and future development in the Ensenada Region. Key areas to target with a Water Fund are protection of land practices and the basins that contribute headwaters and recharge to aquifers, water quality in the aquifers, and augmentation of water supply via water use efficiency, demand reduction, or sustainable water supply sources. The stakeholder potential support, the legal infrastructure, and the economic context for a Water Fund in the Ensenada Region exist. Involvement of stakeholders and especially the CONAGUA through workgroups is fundamental and encouraged in the early states of the process. More research is needed on how the stakeholder, legal and economic trio can be formalized in a Water Fund, in the areas if hydrologic modeling, economic and financial analyses, creation of work groups and drafting bottom up initiatives and objectives in a fund.